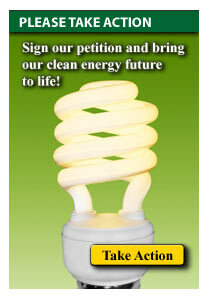 Help the Sierra Club Flip the Switch and bring America's New Energy Future to Life. Send your petition to House Speaker Nancy Pelosi and Senate Majority Leader Harry Reid today. This August, the Senate and House of Representatives both passed landmark bills that - if combined, will put America on the path to energy independence and solving global warming. Right now, members of the House and Senate are working to create a final version of the bill - which could and should include the best of both measures - that raises fuel efficiency standards to 35 miles per gallon and requires that 15% of our electricity be generated by wind, solar or other renewable power. To turn this legislation into real progress we need you to tell Senate Majority Leader Harry Reid and House Speaker Nancy Pelosi to include both the Senate Corporate Average Fuel Economy (CAFE) provision and the House Renewable Electricity Standard (RES) in the final energy bill this fall.